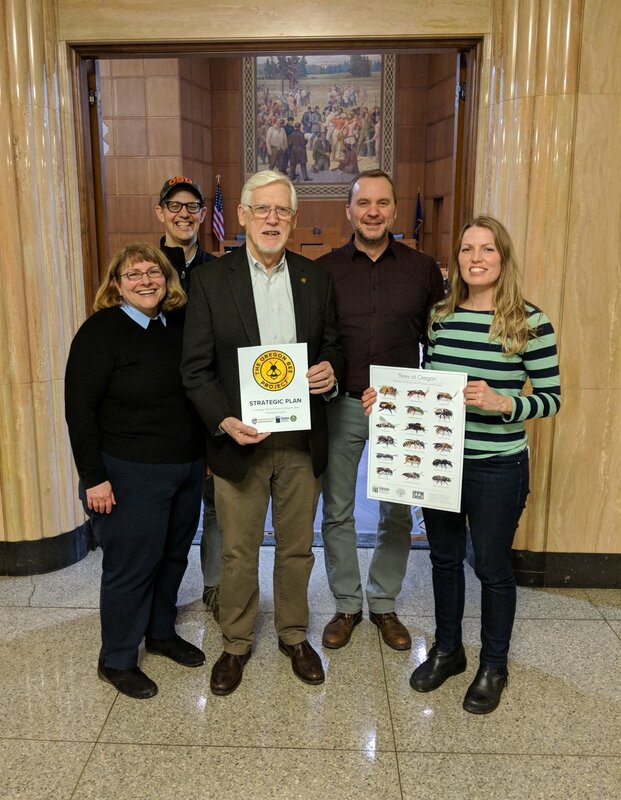 Representative Jeff Reardon, sponsor of Oregon House Bill 3362 (2015), with (left to right) Rose Kachadoorian (Oregon Department of Agriculture, Pesticide Registration and Certification Leader), Andony Melathopoulos (Oregon State University Extension, Pollinator Health Extension Specialist), Clint Burfitt (Oregon Department of Agriculture, Program Manager Insect Pest Prevention and Management) and Christine Buhl (Oregon Department of Forestry, Forest Entomologist). Collecting input from farmers and community members about what bee-friendly practices are currently being implemented and if there is a need for marketing opportunities to promote these products. New state-specific voluntary guidelines for beekeepers, pesticide applicators, and landowners to reduce pesticide exposure to bees. New materials to help educate pesticide applicators and landowners about pesticide exposure to pollinating insects.